Mayor Paula Piccinini was elected Mayor of Manningham City Council in November 2018. Mayor Piccinini migrated to Australia as a five-year-old arriving in Australia in 1972 with her Italian father and Irish mother. She graduated with a double degree in Arts and Law and has practised as a solicitor, barrister and qualified mediator. She was a non-executive RACV director for nine years and she chaired the RACV Community Foundation. 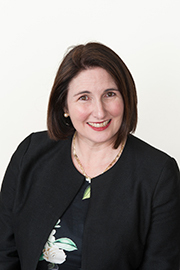 In the community sector, she chaired EDVOS, a leading family violence service in Eastern Melbourne and she managed legal and direct service teams assisting victims of family violence. Mayor Piccinini has lived in Manningham with her husband for 14 years. As a mother-of-three, she is deeply embedded in the community having served on her children's kindergarten committee and as School Council President of their local primary school.